President Obama on Monday released his budget for fiscal year 2011, including his recommendations for transportation funding. The chart above, produced by Metro, shows how Obama officials want to dole out money from the federal New Starts program that helps local areas pay for big transit projects. The gist of it: The blue areas get a lot of money. The non-blue areas do not. Los Angeles County is a non-blue area. I posted here last week that the Federal Transit Administration recently denied Metro’s request for $77 million in New Starts funds in the federal budget to help pay for preliminary engineering work on the Westside Subway Extension and Downtown Regional Connector projects. The reason: the projects haven’t yet been designated as official New Starts projects, although FTA officials are working with Metro on the complex application process. As a result, the FY 2011 budget has no New Starts money for Los Angeles County, the most heavily populated county in the United States, with 9.86 million people. The above chart, and another posted after the jump, shows that in FY 2011 money is going to three projects in the New York metro area, three light rail lines in the Denver area, a light rail line in Honolulu, a pair of light rail lines in Houston and a light rail line and commuter rail project in the Salt Lake City area, among others. Even the ski town of Aspen, Colo., is benefiting, with Small Starts (a program for smaller projects) helping pay for a bus rapid transit project in the Roaring Fork Valley to the north. The county did receive its last installment of nearly $500 million in New Starts money last year to help pay for the Eastside Gold Line, which opened in November. 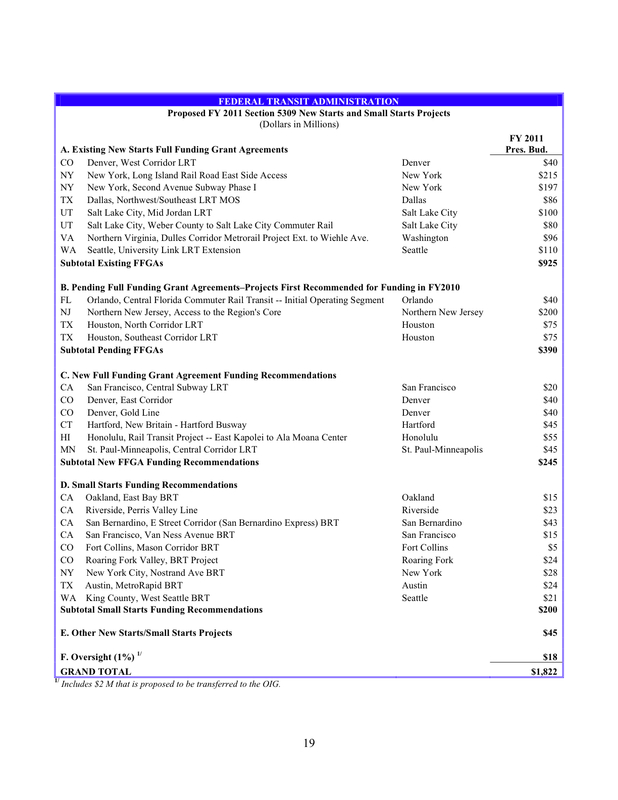 In fairness to the feds, it can also be argued that Metro may have received subway and connector funds this year if the planning process for both had started earlier than 2007 and the projects were farther along.